As many of you know I love Christmas and started decorating our house for Christmas a couple of weeks ago. I started collecting nutcrackers 3 years ago and I would love to show them to you today. Nutcrackers have been around since about the 15th Century and they usually always have a large mouth which can be opened by a lever at the back. These days we associate nutcrackers with the beautiful fairy-tale ballet which is always performed around this time of year. ETA Hoffman wrote a story called "The Nutcracker and The Mouse King" which was then adapted by Alexandre Dumas and Tchaikovsky composed the score for the ballet version of the story in 1892. I have only got three nutcrackers but, since I have 3, I am going to join Three or More Tuesday over at Tams's place and since my Nutcrackers have some red in them I will be linking to Ruby Tuesday over at Mary's Place, The Work of the Poet. He is only a short little fellow! Here is No 2! He is very talented-he can play the drum and the tambourine at the same time! Here is this year's soldier-he has a very happy face I think! Aren't they a handsome bunch! 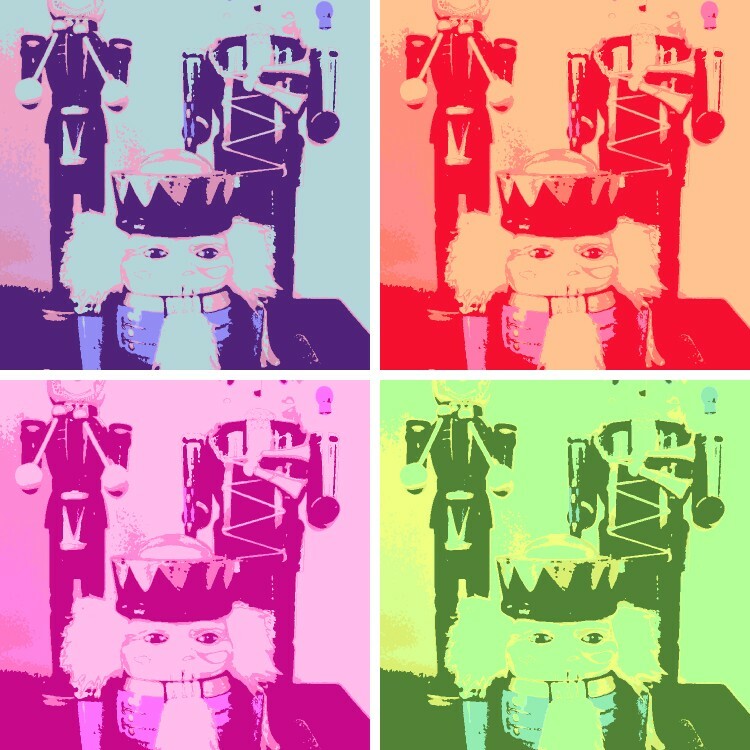 I think they are so fabulous that they should become Pop Art Icons for Nutcrackers everywhere..
Do you like my Andy Warhol Nutcrackers!? Aren't they gorgeous! I am having so much fun playing around at Big Huge Labs! If you haven't been there yet you must go over and have some fun experimenting with your photos! Here is another Big Huge Labs creation based on the work of David Hockney. 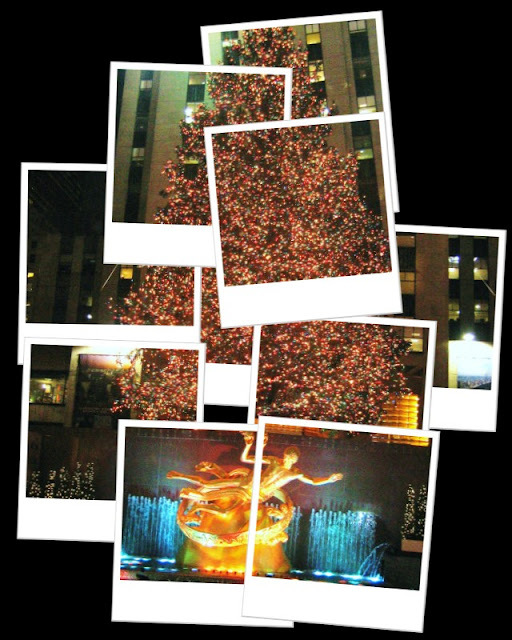 It is a picture of the Christmas tree at the Rockefeller Centre that I took in 2004. You will have so much fun over at Big Huge Labs! Many thanks Tam and Mary for having me today and thank you all for coming to spend 5 minutes with me today. I loved seeing you! So HOW do you crack your nuts with those ones then??? ;-) They are really lovely! I'm sure you will be able to make quite a collection through your travels. Hey Natasha, how do you put a film up like that so you can play the film on your blog??? PS - throat not better but sunshine makes everything seem do-able! They are lovely!I do not know tooo much about nutcracker, I will have to look this up. You have a great colouful blog to start my day. I am delighted that you stopped by! I love your nutcrackers. I am a collector too. Thanks for the link to Big Huge Labs. I can't wait to try it. Nutcrackers like yours are very popular in Germany and I saw many different styles when I lived in Bavaria. Never bought one myself though! Love your Andy Warhol mosiac, very funky. One of our d-i-laws likes Nutcrackers too. I love nutcrackers too! Unfortunately, my husband does not share my obsession...he thinks they're creepy. I have a small collection, which are all relegated to the guest bathroom...I just tell him not to use that bathroom all month! Thanks for stopping by my blog as well, and for the sweet note. Happy Holidays to you! Yes they look great..Happy Ruby Tuesday. We have a tradition with Nutcrackers. Every year my daughter dances in the Nutcracker production. At the end of the show we give her a darling Nutcracker with the year on it. When we are decorating for Christmas, we line them all up on the fireplace, although we will be running out of room on the mantel soon. She is eleven now but still looks foward to getting one after she dances. I'm really bad about going to bed at 1 in the morning and then getting up with my husband early and not going back to bed....I usually don't require lots of sleep but lately I've been exhausted. You're certainly in the Christmas spirit! Those nut crackers are adorable. I especially like the little blue one. What a wonderful cheerful Ruby Tuesday post. 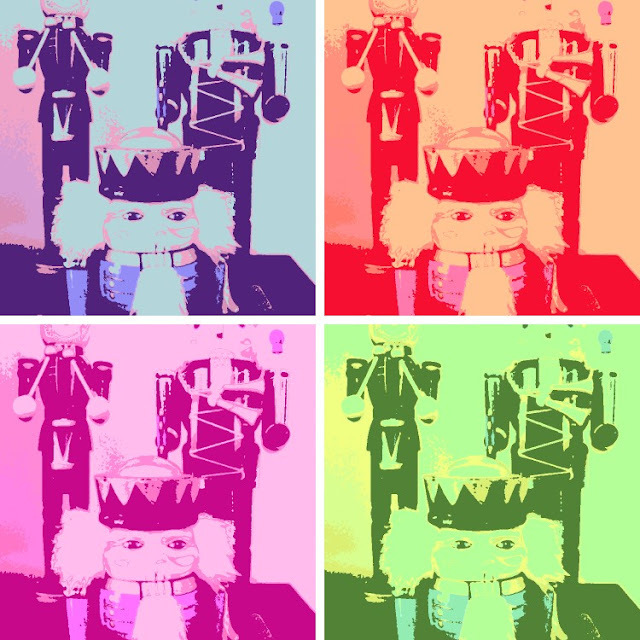 What a handsome collection of nutcrackers you have!! Love how you turned them into artwork too!! Thanks for stopping by to see my cookie jars! I went back to your previous post to have a peek at your Santa cookie jar. What a cutie he is!! Natasha I LOVE Nutcrackers...sadly don't own a single. This christmas I am going to acquire at least one as they are just soooo cute and love em !...yours are precious fella's !.... I especially like your Warhol take : ) ... Thanks for the link to big huge labs, i had no idea but it will be really fun... Thanks so much ! I just LOVE your nutcrackers!!! What a great collection of nutcrackers - after reading this I'm in the mood for Christmas now more than ever! I love nutcrackers. But I don't have any. Thanks Jen. I just googled the site and I also googled corn syrup vs glucose syrup and I should be ok. How stressful is this baking business!